For those fed up with the same old Christmas themed albums year after year, Silva Screen Records gives us something a little different. While there's nothing wrong with traditional Christmas albums - they're an essential part of the magic of the season - sometimes you just yearn for something a little different to spice it up a bit. We've already reviewed Engelbert Humperdinck's new Christmas album this year, Warmest Christmas Wishes and, for traditionalists, festive music doesn't come much better than that. 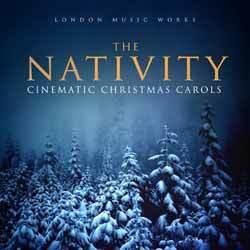 However, The Nativity takes classic favourites and transforms them into the epic sounds of movie trailers and upbeat feel good TV specials / festive film scores. It's not the first time an album of this sort has been released. The Library of The Human Soul & Vienna Session Orchestra's Christmas  and The Cinematic Film Band's Christmas Stories  are just two recent examples. However, Christmas is original compositions (which sound a little like a Hollywood Christmas movie score) and Christmas Stories is more like a traditional Christmas album of carols, just brought up to date slightly. What London Music Works has done with The Nativity is nothing short of breathtaking. Their take on 'The First Noel' gives Hely-Hutchinson's version ('Andante quasi lento e cantabile') from his 1927 Carol Symphony - made famous as the theme tune to the BBC's 1984 Christmas mini series Box of Delights - a run for its money. 'God Rest You Merry, Gentlemen' is given a melancholic twist, while 'O Christmas Tree' (easily the album's high point) has all the hallmarks of an action adventure movie score. Of this album's 16 tracks (52 mini, 49 sec) highlights include the aforementioned 'The First Noel', 'God Rest You Merry, Gentlemen'; and the adrenaline pumping 'O Christmas Tree'. Also of note is the family movie feel of 'In the Bleak Midwinter'; the epic 'O Come All Ye Faithful'; the haunting 'Joy to the World'; the subtle 'Silent Night' and 'Carol of the Bells (Closing). It's the album's diversity of styles that helps to make this such an enjoyable experience. An essential Christmas album that no household should be without.